NEW YORK--(BUSINESS WIRE)--LexisNexis® Legal & Professional, a leading provider of content and technology solutions, announced today the release of PCLaw® 13, which alongside new features, includes a major overhaul to the user interface of PCLaw. The software product has long been an indispensable asset for firms who rely on PCLaw for practice management. PCLaw 13 provides a slick new interface that prominently displays three new dashboards that provide an intuitive at-a-glance view of a firm’s daily activities, client matters and financial performance. Each dashboard is customizable and enables the user to easily drill down for a more in-depth look at the data. My Practice provides an at-a-glance summary of an attorney’s calendar, his or her “to do” list, and most recent matters a given lawyer has worked. The dashboard is structured to reflect how attorneys work and enables them to find the information they are seeking more quickly while also reducing the likelihood of missing a procedural step. The calendar provides a bi-directional integration with Microsoft® Outlook® so appointments scheduled are reflected in the My Practice dashboard and vice-versa. My Clients delivers a snapshot view of the information related to a given client matter including contacts, documents, deadlines and client balances. This puts all the data related to a client at an attorney’s fingertips, provides simplified collaboration and allows the attorney to provide a higher level of client service. My Business offers a summary look of the most frequently requested metrics regarding the financial performance of a firm including income and expenses, billable hours, work-in-process, receivables and bank balances. This provides real-time financial highlights, such as billable hour targets and financial health without having to run reports or cross-reference multiple sources of information, such as spreadsheets. 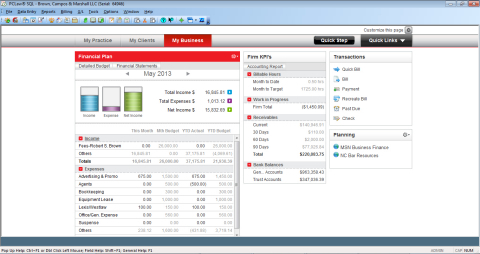 Alongside the new interface, PCLaw 13 provides two major new features designed to streamline client intake and billing processes. With the client intake template, a firm can simply interview a new client – whether in a face-to-face meeting or by phone – or it can email a simple form in Microsoft Word format and automatically import the data into PCLaw when the client returns the form. In each case, the workflow process is the same, which ensures the integrity and completeness of the information and offers options to easily run conflict checks and generate an acceptance (or declination) letter to a client. The email templates make it easier for firms to email a client bill, which also reduces the time to collection. Users can create custom email templates that automatically pull in standard invoice summary details and present it into the body of an email with an attached invoice. This ensures consistent and professional invoicing in a short time. LexisNexis® Legal & Professional is a leading global provider of content and technology solutions that enable professionals in legal, corporate, tax, government, academic and non-profit organizations to make informed decisions and achieve better business outcomes. As a digital pioneer, the company was the first to bring legal and business information online with its Lexis® and Nexis® services. LexisNexis helps professionals at law firms and legal departments of all sizes manage the business element of their practice with innovative software and mobile solutions for customer relationship management, competitive intelligence gathering and assessment, time and billing management, matter management, client analysis, legal holds and more. Through close collaboration with its customers, the company ensures organizations can leverage its solutions to reduce risk, improve productivity, increase profitability and grow their business. Part of Reed Elsevier, Inc., LexisNexis Legal & Professional serves customers in more than 100 countries with 10,000 employees worldwide. 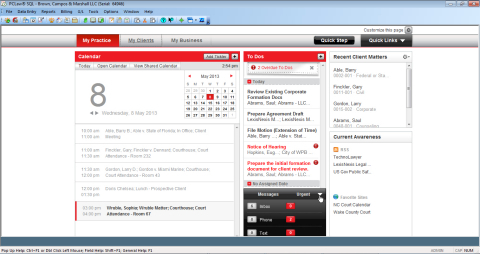 LexisNexis redesigns Law Firm Practice Management Software with launch of PCLaw 13. 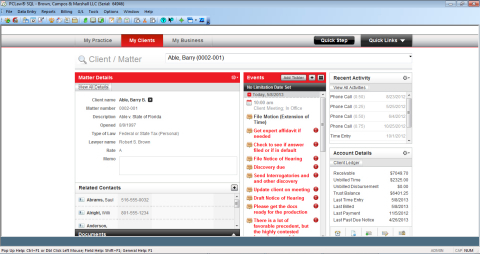 New interface provides insight into a law firm’s daily activities, client matters and financial performance.